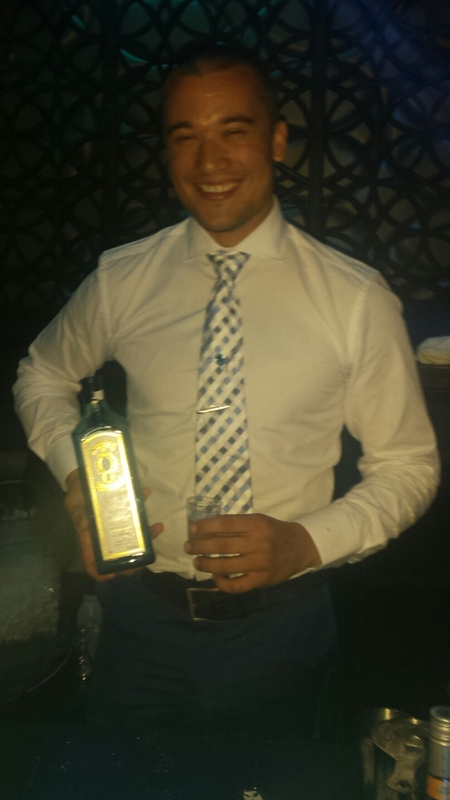 The Laughing Admiral is the judge's favorite in the 2015 Bombay Sapphire Most Imaginative Bartender NYC Competition. It is a gin-based cocktail that includes almond biz and hard cider. Photo courtesy of Bombay Sapphire Gin. Of all the gin joints in all the towns in all the world, she walks into mine. – Rick (Humphrey Bogart) in "Casablanca"
AT this gin station, there are two choices: One with egg yoke and one with egg white. These tastebuds favor the egg white concoction, which also includes sparkling wine. It is subtly sweet, very light and one cannot detect the presence of egg white. However, Jesse Vida’s (Parlor) delicious cocktail would not win the Bombay Sapphire Most Imaginative Bartender NYC Competition, a showdown that went down last night at the upmarket restaurant and nightclub, Lavo New York. 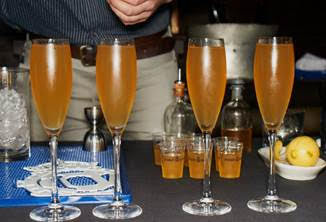 Jesse Vida's entry in the Bombay Sapphire NYC competition includes sparkling wine and egg white and/or egg yoke. Photo by Yours Truly. Based on appearance, aroma, imagination and taste – in the estimation of the judges – that honor is Greg Buda’s (The Dead Rabbit) for a mixture that includes Hard Cider, Mace Tincture and Almond Biz. The almond is one of 10 botanicals that gives Bombay Sapphire Gin its distinctive flavor. The name of the libation that beat out five others from New York City and Connecticut is The Laughing Admiral. (See video below). The victory earns GB a spot in the United States Bartenders Guild's (USBG) Most Imaginative Bartender Cocktail Competition sponsored by Bombay Sapphire Gin and GQ Magazine on 2 Sept. in Las Vegas. The general public has a say in the Bombay Sapphire regional contests, casting votes during the Consumer Cocktail Hour for the People’s Choice Winner. In New York, the people tap Connecticut’s Dimitri Zahariadis (Shamrock/Vasi's/Spartan). A good heavy book holds you down. It’s an anchor that keeps you from getting up and having another gin and tonic.” – Roy Blount, Jr. The dirty half-dozen that competed in the Bombay Sapphire Most Imaginative Bartender NYC Competition, from left, Bob Wagner (Seamstress), Connecticut’s Dimitri Zahariadis (Shamrock/Vasi's/Spartan), Brett Hughes (Madame Geneva), Greg Buda (The Dead Rabbit), Jesse Vida (Parlor), and Jaime Rios (Top of the Standard). 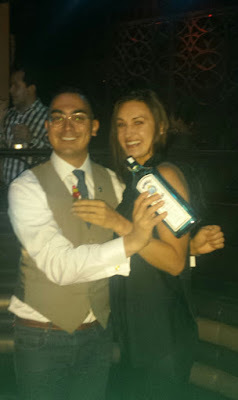 Photo courtesy of Bombay Sapphire Gin. Greg Buda creates The Laughing Admiral. 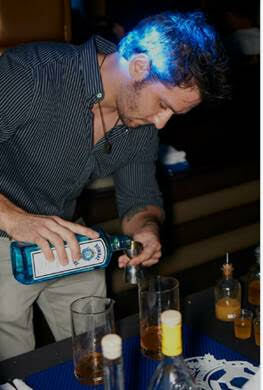 Photo courtesy of Bombay Sapphire Gin. At the USBG Most Imaginative Bartender Cocktail Competition, GB will compete against 28 others, a number pared down from around 1500 in 37 U.S. markets. In addition to the title, the winner earns a cover spot on GQ’s “Men of the Year” December 2015 issue alongside his cocktail. Jerry Rios with Kim Nastro and his Bombay Sapphire Gin creation, featuring jalapeno pepper and cherry tomato.Photo by Yours Truly. Finally, the winner will represent North America in the World's Most Imaginative Bartender Global Competition at a date to be announced in 2016. 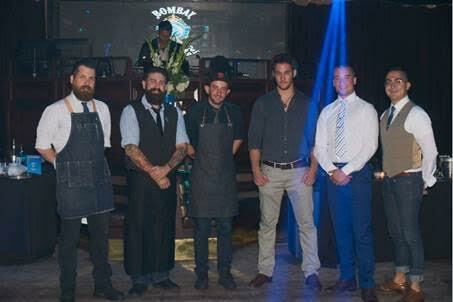 Visit http://www.mostimaginativebartender.com to learn more about United States Bartenders Guild's Most Imaginative Bartender Cocktail Competition; visit http://www.bombaysapphire.com/en-US/default to learn more about Bombay Sapphire Gin.